Opponents of the TPP (TransPacific Parnership) trade deal demonstrated inside the district office of Rep. Jared Polis (D-Co) and then marched down the downtown Boulder, Co mall. 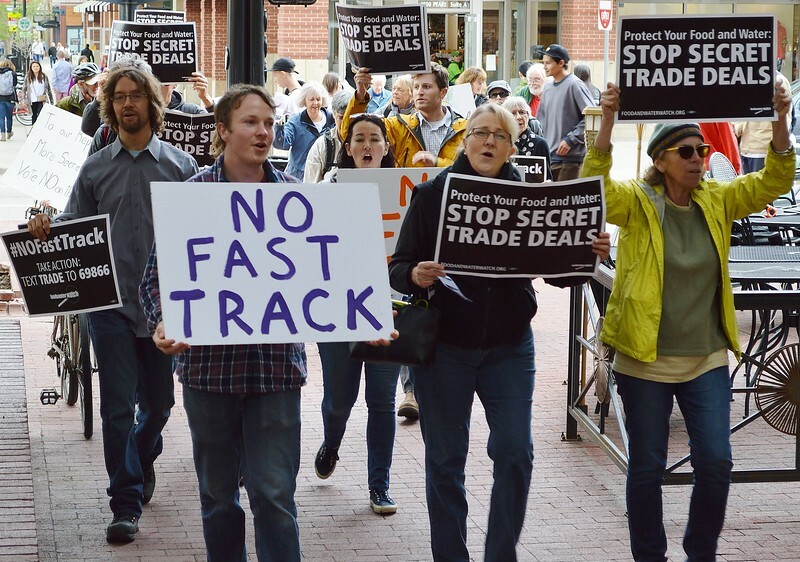 Protesters with signs opposing TPP fasttrack shouting while marching. 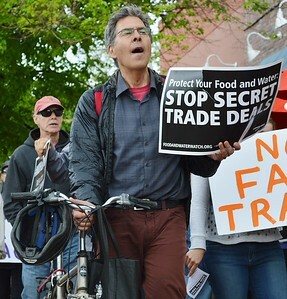 Man with bicycle and sign opposing TPP fasttrack shouts while marching. 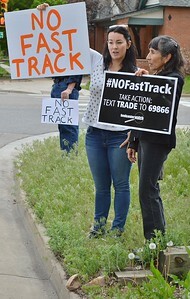 Two women holding signs opposing TPP fasttrack stand next to a city street. 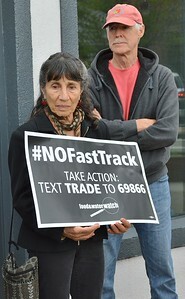 Woman holding sign opposing TPP fast track, amn standing behind her with arms folded. 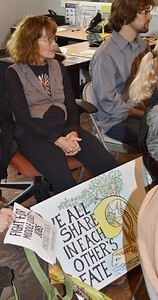 Senior woman sitting in chair gestures with hand while speaking, others sitting in chairs next to her turn to watch her. 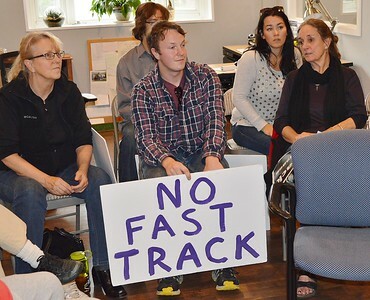 Man sitting in chair at TPP protest holding sign "No Fast Track", other protesters sit next to him. 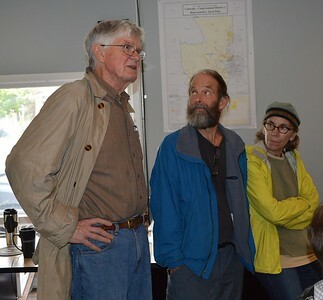 Grey haired man speaking at protest, two other demonstrators turn to look at him. 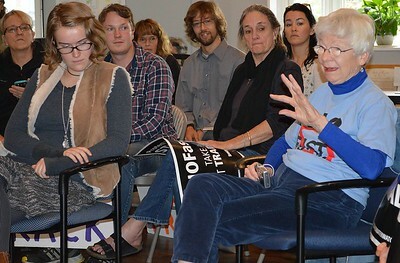 Woman sitting at TPP protest, signs about jobs and the environment in foreground. 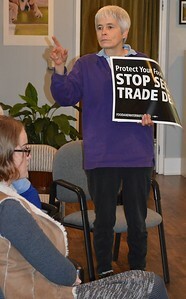 Woman holding sign "Stop Secret Trade Deal" gestures with hand while speaking. 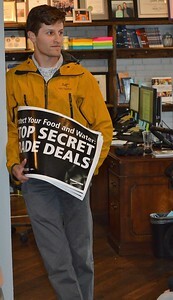 Young man holding sign "Stop Secret Trade Deals", leans against wall in congressmans local office. 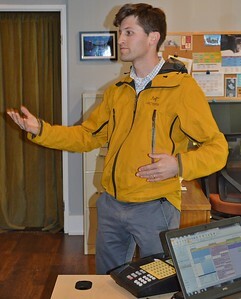 Young man gestures with hand while speaking at TPP protest. 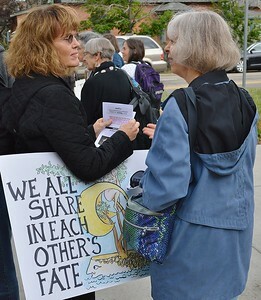 Woman holding flyers and protest sign conversing with woman next to her. 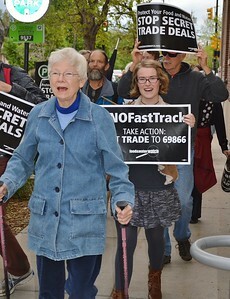 Senior woman shouting while marching in TPP protest, other demonstrators with signs behind her.